Mrs Bryson's Primary 4 class at Drumahoe Primary School are playing PIG!! 6th Class at Piercestown NS are hosting a SNAP Maths Fair, participating in Target Board challenges, a maths trail, maths quiz and much more! Mrs Bryson's Primary 4B class at Drumahoe Primary School are playing PIG!! All classes from Junior Infants to 2nd Class class at Catherine McAuley Junior School, New Ross, Co. Wexford are having 'Maths for Fun!' week with team teaching involving lots of games and problem solving activities. The students at Killina Presentation Secondary School are participating in Maths Week by answering Maths Questions located around the school. Winners will get cool prizes. 2nd class at Scoil San Treasa are solving maths problems. Miss Mc Glinchey class in St Brigids PS are participating in Maths Week by having a Maths Day. Mr. Moloney's 2nd class Maths Wizards class at Scoil Lorcain BNS, Waterford are doing Maths trails, IZAK9 workshops, 3-d shapes experiments, probleming solving games and a Maths for Fun session where parents are invited in to the school to participate in Maths games with their children. St Josephs NS Killals are doing maths trails ..
Maths Department class at The High School, Rathgar, Dublin 6 are holding Maths Relays with all year groups and bringing all Form 5 students to the National Concert Hall on Wednesday morning. 5th & 6th class at St. Mary's N.S., Tagoat, are participating in Maths Week. Primary 7 at Oakgrove Integrated Primary School are participating in Maths Week in a workshop facilitated by STEM Aware for DCSDC. Happy Maths, creating a formula for happiness. This will be the launch event during maths week for DCSDC as they outreach to other NI Schools in the next few weeks. Mr Keenan's Maths Classes at Dean Maguirc College, Carrickmore are participating in Maths Week and promoting maths Problem Solving. Ms. Lavelle's 5th class at Sacred Heart of Jesus Dublin 15 are participating in Maths Week. 3rd-6th class at Moyvore Primary School, Mullingar, Co. Westmeath are participating in maths week. Junior Infants to 6th class at St. Gabriel’s NS Cowper Street, Dublin 7 are holding a Mega Maths Quiz, doing indoor and outdoor Maths Trails, trying to find the junior and senior Tables Champion and having a whole school Maths Games Extravaganza with pupils and parents! The entire Caherleaheen National School , Tralee isparticipating in Maths Week maths fair, maths trail, maths quiz etc. Junior Infants at Kennedy Park School are participating in Maths Week doing lots of hands-on maths, playing maths games with rang a 6, integrating maths and art by making 2-D shape monsters as part of this fortnight's topic - Halloween and learning lots of number rhymes! Primary 4CB class at St Ronan's Primary School, Newry are focusing on Time, creating their own clocks, classroom display and time word problems for Maths Week Ireland 2017. Transition Year class at Ursuline Secondary School are maths hatters day, treasure hunt, code breakers. Sixth Class class at Ballinamere N.S. are participating in Maths Week by doing online Maths games and setting Maths puzzles for the rest of the school. Junior infants, senior infants, 3rd, 4th, 5th, 6th class at Creggs NS are participating in Maths Week: maths trails, maths games, ICT maths games and activities, maths challenges. Gaelscoil Léim an Mhadaidh are doing Maths trails, maths art, board games. First class B Caragh class at Caragh National School are participating in Maths Week by holding a snapfair, using our maths eyes and completing daily puzzles. Scoil Mhuire na Trocaire are following maths trails, holding a maths quiz, hosting a Math's Eyes photograph competition and playing maths games. 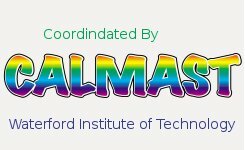 Presentation Secondary School Listowel class at Presentation Secondary School Listowel are participating in Maths Week with daily puzzles, maths competitions and a Maths Treasure Hunt!! Key Stage 2 class at St Colman's PS & All Saints NU are participating in Maths Week, using our IZAK9 cubes for the first time & engaging in our Pupil Numeracy Mentoring programme. Ciara’s 3rd Class class at Skerries Educate Together National School are participating in Maths Week. Maths card games with parent helpers. Maths games for homework. Castledrum NS are participating in Maths Week by completing various activities to showcase our Maths skills. Castledrum NS are participating in Maths Week by completing a variety of activities to help improve our Maths skills. Team 7 class at Scoil Chaitriona Senior are will be problem solving, using our Maths eyes and doing some great maths art! All classes at Monaghan Model School are participating in Maths Week. All students at Pobalscoil Inbhear Scéine,Kenmare,Co.Kerry are participating in mathsweek. Maths Class at Cloverhill Prison school will have a visit from Kjartin Poskitt and Eoin Gill. On Friday Dr John Keogh from IT Tallaght will visit Cloverhill and talk on "Invisible Maths"
6th Class class at Mary, Mother of Hope SNS are participating in an IPad Maths trail around our school using QR codes! Tugann Rang 3 Bunscoil an Luir cuireadh dá dtuismitheoirí teacht isteach fá choinne lá spraoi Mata. Rang 3 Bunscoil an Luir invite their parents to come in for a fun Maths day. St. Eithne's GNS are participating in Maths Week. Each day there will be a Maths Puzzle and on Friday 20th, each class will enjoy a special Maths Activity. Gaelscoil de hÍde, Ros Comáin class at Gaelscoil de hÍde are doing Maths Trails, quizzes, Mangahigh, One Hour of Code, maths in the environment (Maths eyes) and a maths fun day. St. Colmcille's N.S. Quay, Westport. are Full week of interactive activities involving all pupils from infants to sixth. 6th Class class at Kilkerley N.S. are Completing maths trails and taking on the Manga High Maths Challenge! Naíscoil to Rang 6 at Gaelscoil Eoghain are participating in Maths Week with a range of Mental Maths games & challenges! Bilboa National School Co. Limerick are participating in Maths Week. Bilboa N.S. are ensuring that maths is exciting and interesting for everyone this week. We will be spending more time doing practical activities, maths trails and maths games. 6th class at Scoil Mhuire na Trocaire are doing maths trails, holding a maths quiz & judging an In-School Math's Eyes Competition. Termoncanice class at Termoncanice P.S are P.1-P.7 participating in a host of active activites for maths week Ireland. Wesley College Dublin are doing problem a day quizzes, Crystal Maze Challenge, Treasure Hunt, Mathletics and much more. Senior Class at Lisnafunchin National School are working in teams with IZAK 9. All students at Moyne College are doing puzzles in registration each morning and putting up maths facts, maths quotes and maths jokes around the school. Marvellous Maths class at Monaleen National School are Maths Quiz for senior classes. Addition & subtraction tables bee for lower classes. Fourth Year Maths class at Saint Joseph's Community College are Snap Maths! Star of the Sea primary School, Passage West are Maths fair & class participation. 4th Class class at Scoil Mhuire Oranmore are Maths Trail, Surveys and making Tasty 3-D Shapes !!! St Lachteens National School are completing mathematical trails, creating mathematical posters, measuring the length and width of all the classrooms and completing online maths problems! 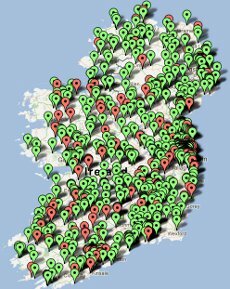 All of the children in Scoil Naomh Molaise, Grange are will be participating in Maths Week 2017! St. Mary's Secondary School Edenderry are participating in Maths Week. Our TYs and 5th years will play Maths Bingo, 3rd years will take part in PRISM. 2nd years will compete in Manga High. 1st years will team up for a maths problem solving quiz. Our Junior certs and TYs will also use BuildUp. Fifth class at Conna NS, co. Cork are participating in the Maths Week. 1st Year Maths class at Mountmellick Community School are participating in Maths Week by doing a Maths Trail around our school. Whole school at Scoil Naomh Bríd, Talbotstown are participating in the Maths Week. 1st, 2nd, 3rd transition year at Lady of Mercy Secondary school, Waterford are participating in the maths week. Mr. Russell's class at St. Stephen's De La Salle are doing a Maths Trail in the city centre, using our Maths eyes outside our school, doing a Maths Quiz, solving Maths Puzzles, and making our own Maths Trail around the school grounds. St John's Girls and Infant Boys School are participating in Maths Week with a quiz, maths art and games! Acorn Class class at Kildare Town Community School are We will be doing a number of different activities that will involve maths and numeracy. 5th/6th class at Scoil Tighearnach Naofa are enjoying maths trails,solving puzzles and having fun with numbers. All classes ( Mr.Henderson) class at Senior Scoil Mhuire, Blakestown, Dublin 15 are participating in Maths Week. We will be doing Maths trails and Maths games/puzzles. All the students class at St Mary's College Galway are participating in Maths Week by completing daily maths puzzles. 1st years at St Raphaels College, Loughrea, Co. Galway are taking part in "Theme Park Maths"
Sign up now to get your school doing Simultaneous Equations Simultaneously! The emphasis of Simultaneous Simultaneous Equations should be on pupils completing the equations - do not over emphasise getting them all correct! 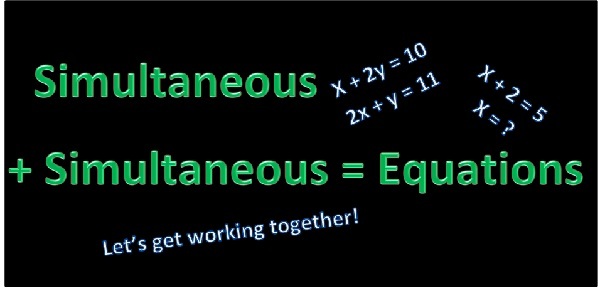 Focus on the meaning of a simultaneous equation - do they understand what it really means? (One definition defines it as 'equations involving two or more unknowns that are to have the same values in each equation'). Emphasise that everyone is going to be doing the same thing at the same time! How many pupils can you get to do Simultaneous Equations Simultaneously in your school...?! Fill out the form below to register your school and then download the appropriate packs for your school. Or if any of the above do not suit why not create your own simultaneous equations? Thanks to Lorna Wilson, a secondary maths teacher, for creating this superb idea for Maths Week! Across the island, there are 4671 pupils participating in Simultaneous Simultaneous equations.